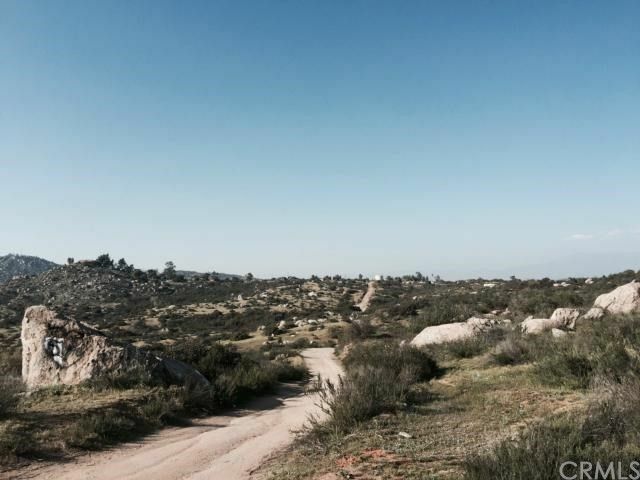 TEN+ (10.17) ACRES of VACANT VIEW LAND in the PRIVATE HILLS of HOMELAND, in SOUTHWESTERN RIVERSIDE COUNTY. Great opportunity to build your family compound/ranch on this "OFF THE GRID" lot. This lots Northeast corner is approximately 1500' South of the SCE power poles that run along La Huerta Rd. Solar, wind, water tanks, well & propane until utilities become closer to you through progress when neighbors North of your lot begin building. Riverside County is the fastest growing County in California. Great lot to use as a weekend get-a-way. Bring your camper, 5th wheel or RV. Frontage of 489'+- on the West side of a cul-de-sac. 910' on the South & North sides. Rectangular TEN ACRES of natural habitat property with many building locations for your home/mobile home, garages, barns, stables, outbuildings, sheds, gardens & landscaping. This private land is located just North of Highway 74 for easy commute to the I-215 or the realigned Highway 79. Centrally located in the middle of Riverside County with all recreation & activities; local schools, churches, convenience stores, outlet & mall shopping, casinos, parks & lakes, mountains, deserts & beaches! Close to the I-215, I-15, Hwy 74, & 79 and the 10 & 60 freeways for easy commute to Los Angeles, San Bernardino, or San Diego County. INVESTMENT BUILD or HOLD!